Help a mostly invisible man become more visible. Speak to the invisible Cassius Olcinius in the Plaza of St. Delyn canton in Vivec. (Optional) Speak to Cassius' father, Lucretinaus. Speak to Fevyn Ralen in the Telvanni canton. (Optional) Return to Lucretinaus for the money to pay off Cassius' debt. Return to Cassius, who is now visible again. Speak to Lucretinaus to receive your reward. 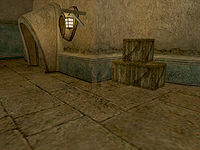 You may find an invisible man (or at least mostly invisible) wandering around in the Plaza of St. Delyn Canton in Vivec. Cassius Olcinius has been cursed by a wizard and asks you to go to Fevyn Ralen for a solution on his behalf, as people are scared of him, and he's too embarrassed to speak with his father, the trader Lucretinaus Olcinius, whose shop you are standing in front of. You can speak with his father first, inside the shop. At first he'll be too busy to offer any help to his son, but will give you 75 gold for your assistance. Refuse to pay the debt. Return to Lucretinaus' shop and mention the debt to him. Lucretinaus will give you the 400 gold. Assuming you pay the debt, either out of your own pocket or with the money Lucretinaus gave you, Cassius will now be visible. He does not have anything to reward you with, other than his thanks. However, Lucretinaus will give you a 100 gold reward. If you paid the debt out of your own pocket, he will also reimburse you. If you pay Fevyn Ralen with your own money, Cassius Olcinius will thank you and the quest will end, but he will actually remain invisible. To properly make him visible, refuse to pay Fevyn Ralen, then talk again with Lucretinaus Olcinius who will give you gold, then return to Ralen. Using console commands, selecting him and typing "setchameleon 0" will make him visible again. 10 A man approached me outside a trader's in Vivec. The odd thing is, I couldn't see him. 20 This man, Cassius Olcinius, says he has been cursed with permanent invisibility. The wizard who cursed him, Fevyn Ralen, is a Telvanni living here in Vivec. He has been afraid to visit the wizard for fear of further retribution, and he has been afraid to tell his father of the problem due to embarrassment. 30 I have agreed to help Cassius find a cure for the wizard's curse. 40 I have decided not to help Cassius remove the wizard's curse. 50 I have spoken to Lucretinaus Olcinius, a trader and the father of the invisible Cassius. He was appreciative to hear information about his son's whereabouts, and gave me 75 drakes in order to help me find a cure. 60 I talked to Fevyn Ralen about Cassius' curse. He tells me that it is not a curse at all, but that Cassius had commissioned a spell to make him permanently invisible. The young man soon realized this was not a pleasant lifestyle and begged the wizard to remove the spell. However, as Cassius still owed the wizard 400 drakes for the original spell, he refused. 70 I have paid the debt that Cassius owed to Fevyn Ralen, and he tells me he has removed the spell. 80 I've chosen not to pay Cassius' debt to the wizard. 90 I spoke to Lucretinaus about his son's debt to the wizard Ralen. The trader did not seem surprised at his son's folly, and gave me the money to pay the debt owed. 100 I returned to Fevyn Ralen and paid him the debt owed by Cassius. Fevyn promised to remove the spell. 120 Finishes quest I've spoken to Lucretinaus Olcinius about his son's cure. He was grateful for all my help, and he gave me 100 septims as a reward for my efforts. 130 Finishes quest Upon returning to the area around the trader's shop, I was greeted by the now-visible Cassius Olcinius. He was very grateful for my help, but he had nothing to offer me in return for my help. 140 Finishes quest I told Cassius Olcinius that Fevyn Ralen is dead. He'll never be visible again.